This homemade costume for men entered our 2016 Halloween Costume Contest. 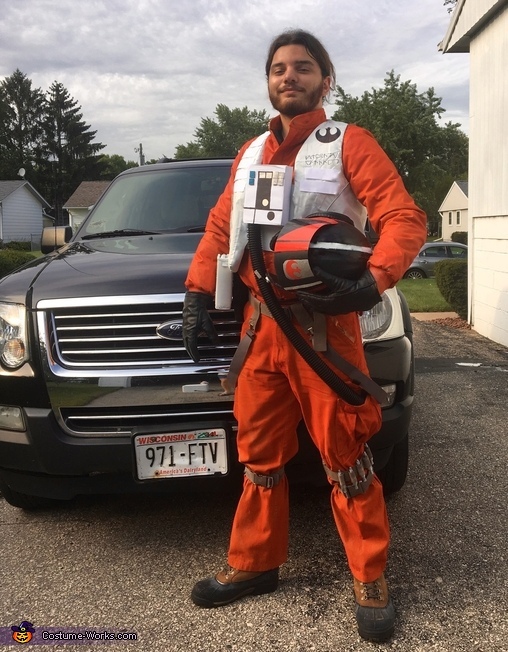 I’ve always wanted to have a costume that was a rebel pilot flightsuit from the Star Wars films like Luke Skywalker going to blow up the Death Star. When The Force Awakens came out, I saw that Poe Dameron had a similar outfit that I thought looked even cooler. Studying the parts of the costume, I realized this could be made in real life using ordinary clothing and various thrift store items, along with lots and lots of spray paint. 1. The construction begun when I found a cheap jacket and cargo pants at a thrift store that resembled Poe’s jumpsuit. I then spray painted them with multiple coats of orange paint. Once they were dried, I tried them on, and from there I knew that I could build off of this base and make a complete costume. 2. Next big piece was the flight vest, which I made with an old life preserver vest. After removing some of the built in foam and cutting off the straps, I sprayed the vest white. Later on, I glued on white strips to act as the “panels,” and hand-drawn the markings and symbols. The small pouch on the vest’s side was a bag I also found at the store and painted it white. 3. The box panel that’s in between the vest was made with a simple cardboard box that I cut down and taped to be the appropriate size. I then detailed it by hand with markers and paint. The tube I attached to it was from on old vacuum tube I had. 4. The straps that I saved from the life vest were combined with a pair of suspenders I found at the thrift store. I painted them all a matching beige color and made them into a belt harness. A saved one more strap to go around my knee area to carry the small grey capsules. Those were made out of pen parts that I salvaged and super glued together to looked like gadgets Poe had on his leg. 5. The hardest piece of the costume may have been the helmet. I took a used ski helmet and sprayed painted it black. I used cut-out pieces from plastic ice cream buckets and super glued them to the helmet on the top and sides. I also put in some foam that I took out from the life vest, painted them black, and attached them inside the panels near the mouth. I found orange safety glasses and super glued them to the helmet. The rest I carefully painted the details and symbols with paint pens. 6. Finally I got some old winter boots and leather gloved to round out the flight costume. My family saw my progress and kept complimenting my creativity and resourcefulness. They loved the final product immensely. I shared photos with my friends and they were very impressed, some jealous in a good way. Overall, this took roughly three weeks to put together and spent about $100 overall for the clothes, parts, and spray paint cans, but it was totally worth it! As long as the paint and pieces don't fall apart, I plan on using this costume not only for Halloween, but also cosplay parties and Star Wars events, including the upcoming movies like Rogue One and Episode VIII.